The ninth annual Anita Boon Pro-Am returns to the North Shore Golf Club this year, with the best women in golf from New Zealand and Australia set to vie for a AU$30,000 prize purse, thanks to long standing sponsors KFC and Coca Cola Amatil NZ. Co-sanctioned again by New Zealand Professional Women Golfers (NZPWG) and Australian Ladies Professional Golf (ALPG) Tour, the two-day women’s professional tournament allows amateurs the opportunity to play alongside the up-and-coming stars of the game on one or both days. “The ALPG is once again delighted to be a sanctioning partner for the 2017 Anita Boon Pro-Am. This is the fifth consecutive year that the ALPG has co-sanctioned the event along with the NZPWG, and each year the event grows in stature,” says Karen Lunn, CEO of ALPG. This year’s event has been moved forward to be held on Thursday, September 21 and Friday, September 22, 2017. The move aims to provide further playing opportunities for Kiwi professionals as they head into tour schools and major events in the summer, including the McKayson New Zealand Women’s Open the following week. The proximity to the McKayson New Zealand Women’s Open is expected to boost the competition. “We are expecting a great field while still giving our up-and-coming Kiwi golfers the opportunity to play alongside their Australian counterparts, as well as some of the world’s best golfers,” says Vicki Aitken, NZPWG Trustee. Also increasing competitiveness on the green is the Trans-Tasman Trophy, created for the 2015 tournament in response to the increasing number of Australian golfers participating in the event. Australians have taken out the trophy for the last two years, but this year is another opportunity for the Kiwi’s to claim the trophy and its naming rights, christening it a jandal rather than a thong. This year is the first year the Anita Boon Pro-Am will support Look Good Feel Better The charity started in 1992, and has supported 38,000 women through their cancer treatment. Ninety-seven percent of LGFB participants felt that the programmes effect on their confidence and self-esteem helped their outlook on treatment. “The support from this event will directly help to fund Look Good Feel Better programmes, which are free for any woman facing cancer, of any age, in any stage of their treatment and recovery,” says Clare O'Higgins. 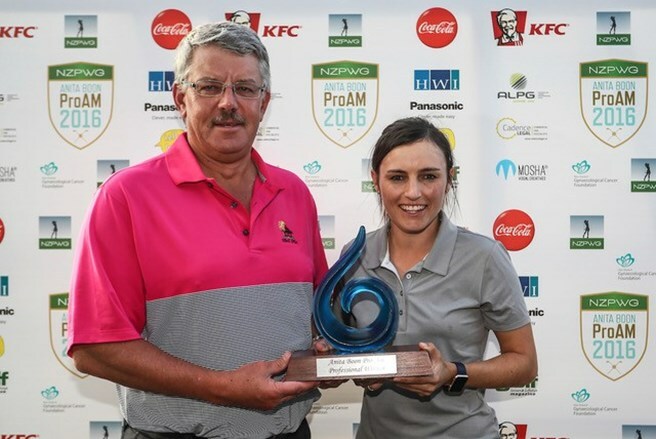 As in previous years the Anita Boon Pro-Am also supports the KFC Golf Scholarship, which was awarded to Liv Cheng in 2017 to support her development and progression on the Symetra and LGPA tours. Entries to the Anita Boon Pro-Am are open, visit www.nzpwg.com for more information.